With all the choices in the world to watch on Netflix, Amazon, and Hulu we watched Sgt. Pepper’s Lonely Hearts Club Band to celebrate Valentine’s Day. It’s a big-budget, movie musical released in 1978 starring Peter Frampton and the Brothers Gibb. Robert Stigwood – the man behind Grease, Saturday Night Fever, Tommy, and Moment by Moment was the leader of this ultimately and publically disgraced band. He managed Cream and the Bee Gees. He produced Hair, Jesus Christ Superstar, and Evita on Broadway, and won the Tony award in 1980 for Best Musical in the US. This might give you an idea why Sgt. Pepper’s Lonely Hearts Club Band was such a huge production and expected to be such a big hit. On paper it’s easy to see how it was a lock for success. The pitch had to be pretty easy with key words like, The Beatles, The Bee Gees, and Peter Frampton – the golden boy of the suburbs during the summer of ‘77. Frampton’s album, “Frampton Comes Alive,” outsold every major album of the day the year before this movie was released and it continues to hold sales records today. The Bee Gees were enjoying the success of Saturday Night Fever, and the line-up of guest stars was stellar featuring Alice Cooper, Aerosmith, George Burns, Earth, Wind and Fire, and Steve Martin. Legendary Beatles producer, George Martin, and engineer, Geoff Emerik, participated in the making of this film which lent more respect and credence to the project. It was a no-brainer for the movie exec’s in Hollywood. The premise was a musical that transformed songs from Sgt. Pepper’s Lonely Hearts Club Band and Abbey Road into a compelling and universal love story — complete with a catchy, marketable soundtrack written by John, Paul, and George to turn Generation X on to the Beatles. The Beatles were noticeably absent and perhaps that’s one of the reasons this film just didn’t work for audiences at the time. It was loosely adapted from the 1974 off-Broadway musical “Sgt. 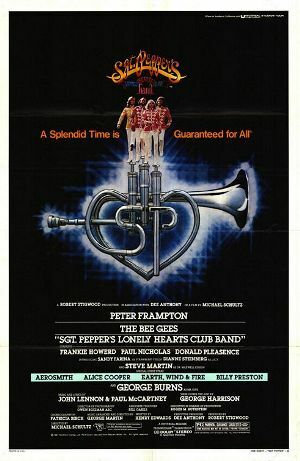 Pepper’s Lonely Hearts Club Band On The Road.” Peter Frampton is cast as the one and only Billy Shears – Leader of Sgt. Pepper’s Lonely Hearts Club Band, and Sandy Farina is his love interest, Strawberry Fields. Beatles conspiracy theories claim Billy Shears is William Shears Campbell, also known as William Campbell, (born 15 November 1943). He is most commonly known for replacing Paul McCartney after his supposed death in 1966. (Here is a link to a “Paul is Dead” conspiracy theory >>> https://www.youtube.com/watch?v=O6wRwtcwKv4 ). The Bee Gees are cast as Mark, Dave, and Bob Henderson, the members of the re-formed Sgt. Pepper’s Lonely Hearts Club Band. George Burns is charming as Mr. Kite – and Beatles song lyrics tell us this is for his benefit. Twenty-nine Beatles songs are woven together and sung by an eclectic group of personalities who perform disco versions of reproduced Beatles hits. Sgt. Pepper and the Band rocket to stardom after signing to Donald Pleasance’s shady Big Deal (B.D.) record label, only to have their good fortune change after Mean Mr. Mustard (Frankie Howard), an underhanded real-estate agent, steals the magical musical instruments from Heartland and ultimately takes them to the FVB (Future Villain Band.) FVB is the evil force that poisons young minds, played expertly by Aerosmith in contrast to the squeaky cleanliness of Frampton and the Bee Gees. Seeing Steven Tyler and Joe Perry frozen in time, always young and always beautiful, making “Come Together” their own, is worth watching this whole movie. Frampton and the Bee Gees use amateur pantomime skills, vacant stares, and disco hybrids of Beatles classics to make Heartland the same sweet world it was when the movie began. Robert Stigwood’s film turns a brilliant sounding concept into a shiny, gold-lamé encrusted, sophomoric variety show even the Monkees would have been hard pressed to reap praise on. The disastrous critical and commercial failure of RSO’s movie version of Sgt. Pepper’s Lonely Hearts Club Band crippled the company. Stigwood never really recovered his previous success, and glory. Frampton cringes anytime this film is mentioned, and the Bee Gees faced a cultural backlash shortly after the theatrical release of Sgt. Pepper’s Lonely Hearts Club Band. You might be asking yourself, is this movie worth watching at all – and we’re torn when we tell you, yes. Beatles purists might tell you the music has been butchered, but we say, “it’s been tweaked with the sound and technology of the day.” It’s a cultural musical phenomenon preserved on film and a great illustration of how something so right can go so wrong in the movie business.